Wnt signaling in cervical cancer? 2. Department of Obstetrics and Gynecology, the Second Xiangya Hospital, Central South University, Changsha, Hunan 410011, China. Cervical cancer (CC) is the second most common malignant cancer in women. CC is difficult to diagnose, has a high recurrence rate, and is resistant to systemic therapies; as a result, CC patients have a relatively poor prognosis. One potential link to CC is the Wnt signaling pathway and its downstream effectors, which regulate cell differentiation, proliferation, migration, and fate. The aberrant activation of Wnt signaling is associated with various cancers, including CC. Recent studies have shown that activating or inhibiting the intracellular signal transduction in this pathway can regulate cancer cell growth and viability. 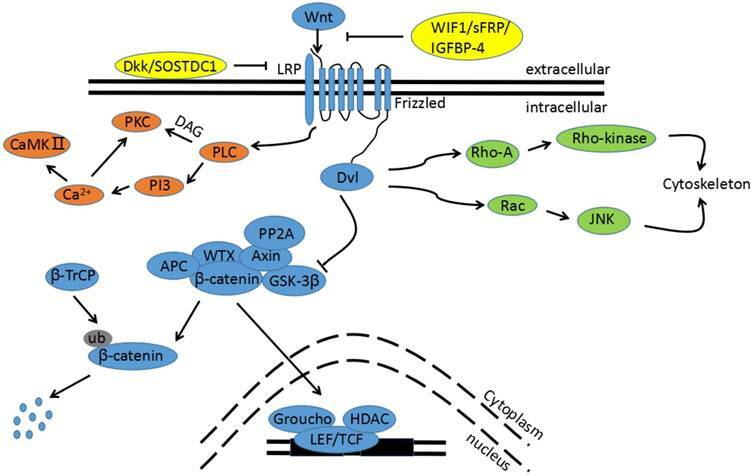 This review will summarize the experimental evidence supporting the significance of the Wnt signaling pathway in CC, and will also discuss the current clinical role of Wnt signaling in CC diagnosis, therapy, and prognosis. The Wnt signaling pathway is a complex network of proteins involved in cell differentiation, proliferation, migration, and polarity. These processes are vital to embryonic development, tissue regeneration, stem cell maintenance and homeostasis [1-3]. However, ectopic regulation via DNA mutation and methylation in the Wnt signaling pathway can induce molecule changes in the pathway[4-7]. Abnormal Wnt pathway activation has been implicated in HCC, breast cancer, osteosarcoma , bone cancer, and colorectal cancer. More recently, it was also associated with oropharyngeal cancer, oral cavity cancer, and CC[14,15]. Some studies have indicated that Wnt signaling plays a major role in regulating normal keratinocyte proliferation and that inhibition of the pathway appears to be an important step during cervical carcinogenesis. CC is the second most commonly diagnosed cancer and the third leading cause of cancer death among women in developing countries. In 2012, there were approximately 527,600 new CC cases and 265,700 CC deaths worldwide. Past squamous histology viewed cervical cellular abnormalities as the precursor of CC. However, recent Human Papillomavirus (HPV) research has shown that chronic HPV infection is linked to the development of a high-grade precursor lesion and invasion. HPV belongs to the papillomavirus family, which is responsible for cervical neoplasias and other oropharyngeal and anogenital cancers. HPV can only infect epithelial cells; additionally, the cell must be terminally differentiated for the virus to complete its infectious lifecycle. Because of this, the infected cell remains active in its cell-cycle progression and no longer undergoes apoptosis. To summarize, several studies suggest that, in CC, the aberrant activation of the Wnt pathway promotes cancer cell growth and invasion. We will review recent studies from literatures that describe the relationship between the Wnt signaling pathway and CC. Wnt signaling has emerged as a critical regulator of cell development, proliferation, differentiation, adhesion, and polarity[20,21]. The term Wnt was adopted in 1991; it is an abbreviation of homologous wingless (wg) and Int-1, traits seen in flies and mice, respectively, Wnt proteins are a family of highly conserved secretory glycoproteins, which include 19 Wnt ligands. These ligands couple to various receptors, activating different downstream pathways. In humans, there are currently 11 identified receptors in Wnt signaling that are members of the Frizzled (Fzd) family: Fzd1 through Fzd10 and Smo. The other receptors involved are co-receptors low-density lipoprotein receptor-related proteins (LRP) 5 and 6. The downstream pathways activated by the aforementioned receptors are classified as either canonical or non-canonical, as shown in Figure 1. The canonical Wnt pathway is activated when the seven-pass transmembrane receptors encoded by Fzd genes and LRP5/6 co-receptors receive secreted Wnts; this is required in order to recruit cytoplasmic phosphoprotein Disheveled (Dsh/Dvl). GSK3β is a major negative regulator of the signal pathway. Without the presence of Wnts, GSK3β forms a multi-protein complex with adenomatous polyposis coli (APC) and Axin. This is called the “destruction complex” and phosphorylates β-catenin by keeping cytoplasmic β-catenin at a low level. Proteasomes then target phosphorylated β-catenin for further degradation. Nevertheless, in the absence of Wnt ligands, β-catenin is mainly located at cellular junctions. When Wnt signaling is initiated, the destruction complex is disrupted and GSK3β is phosphorylated to an inactive form, ceasing β-catenin phosphorylation. Thus, cytoplasmic β-catenin is transported into the nucleus, binding to the promoter region of target genes with TCF/LEF. Non-canonical Wnt signaling, defined as the β-catenin-independent pathway, is primarily classified into either the planar cell polarity pathway (Wnt/PCP) or the Wnt/Ca2+ pathway. Both pathways are reported to contribute to developmental processes. These include planar cell polarity, convergent extension movements, and cell migration[27-29]. Activating these pathways requires the Wnt ligands (WNT4, WNT5A, and WNT11) to be bound to the Fzd receptor without LRP 5/6 co-receptor prior to activating the Dsh/Dvl protein. The Wnt/PCP pathway, also known as the Wnt/JNK pathway, is important in both asymmetric cytoskeletal organization and polarized cell migration. Wnt-mediated activation of small GTPase Ras homolog gene family member A (RhoA) and Rac activates the c-Jun N-terminal kinase (JNK) cascade. In the Wnt/Ca2+ pathway, binding Wnt ligands to Fzd receptors promotes Dvl recruitment in complexes with heterotrimeric G-proteins. This activates phospholipase C (PLC), resulting in inositol 1,4,5-triphosphate-3 (IP3) generation and subsequent Ca2+ release. The increased intracellular Ca2+ concentration activates Ca2+-dependent enzymes that are responsible for mediating cell fate, adhesion, and migration[33,34] such as calcineurin and calmodulin-dependent kinase Ⅱ(CamkⅡ).. CamKⅡ can also activate a nemo-like kinase (NLK), which phosphorylates TCF transcription factors and antagonizes canonical Wnt signaling. The Wnt signaling pathway is also regulated by several endogenously secreted Wnt antagonists. Wnt inhibitory factory 1 (WIF1) and members of the secreted frizzled-related protein (sFRP) family bind with Wnt ligands to inhibit both canonical and non-canonical pathways[36,37]. Additionally, the Dickkopf (Dkk) family interacts with the LRP 5/6 co-receptors to block canonical Wnt signaling. Kathryn D. Henley et al demonstrated that sclerostin domain-containing protein 1 (SOSTDC1) interacts with the LRP6 to regulate Wnt activity. IGFBP-4 was also recently reported to inhibit canonical Wnt signaling by inhibiting the binding of Wnt3A to Fzd8 and LRP6. Lastly, the intracellular negative Wnt regulator, Runt-related transcription factor 3 (RUNX3), inhibits the Wnt signaling pathway by forming a complex with the TCF/β-catenin complex. Aberrant Wnt signaling pathway activation is found in various cancers, including CC. Genetic or epigenetic changes can result in mutations in Wnt signaling components such as Wnt ligands, Wnt inhibitors, membrane receptors, and intracellular mediators and can cause abnormal Wnt pathway activation. Some studies have shown the involvement of certain Wnt signaling genes in CC pathogenesis. Among these Wnt signaling components, mutated Wnt ligands are extensively characterized in CC. Wnt7A was found to be strongly downregulated in cell lines and biopsies that were derived from CC. Wnt10B mRNA was relatively highly expressed in Hela S3, a type of cell line derived from CC. There is also evidence that shows overexpression of Wnt14 in cell lines. Li lin et al performed the immunohistochemistry to examine Wnt5A expression in 94 paraffin-embedded CC samples; the results showed an overexpression of Wnt5A in CC tissue compared to adjacent normal cervical tissue. Wnt11 expression not only showed more in CC than in cervical intraepithelial neoplasia and in normal cervical tissue, but also increased in a manner that corresponded with the progression of CC[45,46]. Carlos Perez-Plasencia et al analyzed the expression levels of 55,000 mRNA sequences. In this work, there is a significant increase of Wnt4 and Wnt8A in HPV16 CC compared to normal cervical epithelia. In the in-depth investigation, they also found altered expression of several receptors in CC, including increased Fzd2 and Fzd10 expression and decreased Fzd7 expression. Among the intracellular cascades, Wnt pathway dysregulation via β-catenin is a frequent event in human cancers. In HPV-positive cells, β-catenin expression is predominantly localized in the cytoplasm and nucleus; in contrast, HPV-negative cells typically show β-catenin expression in the cell membrane. However, in HPV-positive cancer cells, β-catenin cytoplasmic and nuclear protein levels, as well as β-catenin mRNA levels, were significantly decreased[50,51]. Gayatri Rath analyzed the expression pattern of both the active (pGSK3β-Try216) and inactive (pGSK3β-Ser9) forms of GSK3β in different stages of CC. Active GSK3β was abruptly expressed in normal cervical tissues, but showed decreased expression in precancerous and cancerous lesions. Furthermore, precancerous and cancerous tissues displayed a strong cytoplasmic and nuclear inactive GSK3β immunoreactivity while normal cervical lesions did not show detectable immunostaining. There is also evidence suggesting an overexpression of Dvl-1 in cervical cell lines. In addition, phosphoprotein phosphatase 2A (PP2A) is actively expressed in normal cervical epithelia against CC tissues[48,53]. Another form of pathway dysregulation was demonstrated via hypermethylated Axin and APC promoter CpG islands, which resulted in altered Axin and APC expression in CC[54,55]. Additionally, microarray expression studies of CC-derived tumors and cell lines have identified the deregulated expression of genes involved in the Wnt pathway; TCF7 was found to be upregulated while TCF3 was downregulated. Indeed, epigenetic silencing of Wnt pathway inhibitor genes frequently occurs in cancer. Jaehyouk Lee found that the Hela and SUN-703 cell lines exhibited a substantial decrease in DKK-1 mRNA levels. Following a treatment with a DNA methyltransferase (DNMT) inhibitor, an RT-PCR analysis showed that the DKK-1 gene exhibited transcriptional repression due to a hypermethylated promoter. Similarly, promoter methylation resulted in CpG island enrichment and silenced the WIF1, SFRP and DKK-3 genes in CC[59-61]. The Wnt signaling pathway. The blue pathway is the canonical Wnt/β-catenin pathway. Wnts binding to its receptors from Fzd family stimulates the canonical pathway. The multi-protein complex is then inhibited and GSK3β is phosphorylated to an inactive form, leading to a block in β-catenin phosphorylation. Thus, cytoplasmic β-catenin is transported into the nucleus, binding to the promoter region of target genes with TCF/LEF. The green pathway is one non-canonical pathway, also called the Wnt/PCP pathway. Activation of the Wnt/PCP pathway requires the Wnt ligands (WNT4, WNT5A, and WNT11) to bind to the Fzd receptor without LRP 5/6 co-receptor prior to the activation of the Dsh/Dvl protein. Downstream RhoA and JNK cascades are then initiated. The orange pathway is the other non-canonical pathway, called the Wnt/Ca2+ pathway. Binding Wnt ligands to the Fzd receptor promotes Dvl recruitment in complexes with heterotrimeric G-proteins. This activates PLC, resulting in inositol IP3 generation and subsequent Ca2+ release. The increased intracellular Ca2+ concentration activates Ca2+-dependent enzymes, such as CamkⅡ. The yellow proteins are endogenously secreted Wnt antagonists. Alongside the changes in the canonical Wnt/β-catenin pathway, there are also altered components of the non-canonical pathway that are associated with CC. It is suggested that RhoA and Rac1 immunoreactivity is stronger in cervical squamous intraepithelial lesions (SIL) than in samples without SIL. Nuclear expression of Rac1, in particular, is observed in SIL but not in samples without SIL[62,63]. In summary, most results showed that Wnt signaling components are increased and Wnt pathway inhibitors are decreased in CC. This phenomenon therefore suggests that Wnt signaling may be activated in CC. However, there are several reports that Wnt signaling components, such as Wnt7A and Fzd7, are decreased in precancerous and cancerous lesions. Wnt7A can induce both canonical and non-canonical pathways, depending on the receptor it binds; furthermore, it has also been reported that Wnt7A suppresses tumors in clear cell renal cell carcinomas (CCRCC). In context of these points, the specific mechanism of Wnt7A in CC must be further studied. HPV plays an important role in the initiation and progression of CC. β-catenin has been shown to accelerate HPV type-16 mediated cervical carcinogenesis in transgenic mice; moreover, the transformation of HPV expressing human keratinocytes requires activation of the Wnt pathway[65-68]. Activating the canonical Wnt pathway is therefore necessary and sufficient to induce the transformation of HPV-immortalized cells. Additionally, experiments have shown that viral oncogenes E6 and E7 are actively expressed in CC tissues. Because of this, E6 and E7 expression in epithelial cells and their interactions with cellular proteins have become the center of the HPV carcinogenic research. Not all patients infected by HPV will develop CC, however. Several findings suggest that the activation of the canonical Wnt pathway represents a secondary requirement in order to initiate malignant transformation[70,71]. There are also several recent studies indicating the impact of the E6 and E7 oncogenes in Wnt signaling, as seen in Figure 2. Both E6 and E7 upregulate β-catenin expression and enhance TCF-mediated transcription. This is attributed to the decrease of ubiquitin ligase type 3 Siah-1 protein, which acts as beta-transducin repeats-containing proteins (β-TrCP) and induces β-catenin degradation. Furthermore, the E6/E6 associated protein (E6AP) stabilizes β-catenin. The mechanism of the interaction between E6/E6AP and β-catenin has not yet been clarified, but E6/E6AP could alternatively participate in the sequestration of a negative regulator in Wnt signaling. Another possibility is that E6 induces Myeloid zinc finger 1 (MZF1) expression, and consequently activates NK2 homeobox 1 (NKX2-1) transcription. Because the Forkhead box protein M1 (FOXM1) promoter contains three putative sites for NKX2-1, and because FOXM1 can induce β-catenin nuclear translocation by directly binding to β-catenin, E6 indirectly activates the Wnt signaling pathway[68,74,75]. Additionally, in vivo studies show that E6 and Dvl2 interaction enhances TCF transcriptional activity. E7 also strongly binds to the catalytic subunit of PP2A to inhibit its activity, and subsequently contributes to β-catenin stabilization in the cytoplasm. As stated, the Wnt signaling pathway participates in cell differentiation, proliferation, migration, polarity, and fate, playing an important role in the processes of embryonic development, tissue regeneration, stem cell maintenance, and homeostasis. Wnt signaling continues to play a critical role in these processes under pathologic conditions, including cancer[78,79]. Recent investigations have made it evident that ligands, receptors, inhibitors, and other Wnt pathway components are implicated in CC. Ramos-Solano et al demonstrated that restoration of Wnt7A in CC-derived cell lines decreases cell proliferation, cell viability, and migration rates. Previous studies have suggested that the tumor suppressor properties of Wnt7A are attributed to the hypermethylation of promoter CpG islands in cancers[80-83]. Moreover, the three CpG islands assessed within the Wnt7A promoter were methylated in Hela and SiHa cells. Chung et al revealed that the epigenetic silencing of SFRP genes leads to oncogenic activation in Wnt signaling and contributes to cervical cancer progression via the EMT program. Li et al reported that the activation of β-catenin is required to sustain EMT-associated stem cell-like traits in cells. Similarly, the epigenetic silencing of the WIF1 gene is a frequent event in cervical oncogenesis. Whether in vitro or in vivo, WIF1 has been shown to reduce cell proliferation by inducing G2/M arrest. This blocks tumor progression by inhibiting the Wnt/β-catenin pathway and subsequently downregulating c-Myc, cyclin D1, and CD44. Furthermore, it inhibits invasion by upregulating E-cadherin, inhibits angiogenesis by downregulating Wnt1 and VEGF, and induces apoptosis by upregulating p53 and downregulating Bcl-2. Impact of E6 and E7 oncogenes in Wnt signaling. A) The binding of E6 and Dvl can block the degradation of β-catenin and enhance TCF transcriptional activity. B) E6 and E7 bind to the catalytic subunit of PP2A to inhibit its activity and subsequently contribute to β-catenin stabilization in the cytoplasm. C) E6/E6AP can protect β-catenin from degradation. D) E6 induces MZF1 expression and consequently activates NKX2-1 transcription before promoting FOXM1 expression. FOXM1 can then induce β-catenin nuclear translocation. E) E6 and E7 upregulate β-catenin expression and enhance TCF-mediated transcription; this is attributed to the decrease in Siah-1 protein. As research about Wnt signaling progressed, the non-canonical Wnt pathway was also found to be associated with cancers. Studies indicate that the Wnt/Ca2+ pathway is linked to the occurrence of cancer stem cells and carcinogenesis. Likewise, the non-canonical Wnt pathway plays an oncogenic role in CC. Carlos Perez-Plasencia et al reported that the PCP pathway plays a role in differentiation processes during CC pathogenesis. Heng Wei et al revealed that Wnt11 is positively associated with P-JNK1 levels and that Wnt11 contributes to tumor cell proliferation and invasion in CC patients through the Wnt/JNK pathway. In conclusion, the transformation and carcinogenesis of HPV expressing human keratinocytes requires the activation of the Wnt pathway. Additionally, activating canonical and non-canonical Wnt signaling can contribute to tumor cell proliferation, invasion, and apoptosis either individually or through several other means. All the biological processes of a cell are attributed to the interaction of different intracellular biomolecules. Likewise, tumorigenesis requires a more complicated interactive network. In this section, we will address the potential relationships between the Wnt signaling pathway and other biomolecules and signaling pathways in CC, as shown in Figure 3. Studies from several laboratories indicate that the aberrant expression of intracellular biomolecules can promote or inhibit the proliferation, growth, migration, and invasion of CC in vitro or in vivo. Judith N. Kloth et al reported that TGF-β1 plays a role in Wnt signaling via Fzd receptors in tumorigenesis; furthermore, TGF-β1 can downregulate DKK1 and SFRP4 and therefore enhance Wnt signaling. Enhancer of zeste homolog 2 (EZH2), a catalytic core component of the polycomb repressive complex 2 (PRC2), has recently been indicated to be involved in CC development and progression. Sulfiredoxin may also promote CC metastasis through the Wnt_β-Catenin signaling pathway. Results have shown that EZH2 promotes cell proliferation and tumor formation in CC via the epigenetic silencing of GSK-3β, which activates Wnt/β-catenin. There are also studies verifying that many intracellular biomolecules can promote proliferation, migration, and invasion by activating Wnt signaling[89-92]. Conversely, Nan Cui et al reported that Slug may inhibit CC cell proliferation in vitro and tumor formation in vivo by suppressing Wnt/β-catenin pathway activity. This study was the first to show via a Hela-xenograft tumor that DIF-1 inhibits tumor growth through the Wnt signaling pathway by suppressing β-catenin, TCF7L2, and cyclin D1. 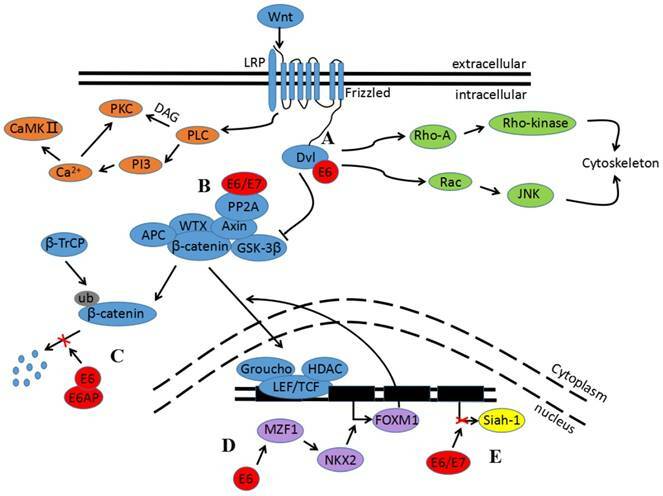 Cross-talking between Wnt signaling and other biomolecules and signaling pathways. A) TGF-β1 enhances Wnt signaling via Fzd receptors. B) EZH2 activates Wnt/β-catenin by the epigenetic silencing of GSK-3β. C) DIF-1 inhibits Wnt signaling pathway through suppressing β-catenin. D) The suppressive activity of miR-328 in Wnt signaling ascribes to downregulation of TCF. E) Slug can inhibit the activity of Wnt/β-catenin pathway. F) miR-142-3p downregulates Fzd7, resulting in suppressing Wnt signaling activity. G) AMPK activators inhibit the Wnt/β-catenin pathway by suppressing DVL protein synthesis via AMPK/mTOR signaling. H) miR-135 downregulates β-catenin via suppressing the expression of Siah-1, thereby contributing to inhibition of Wnt signaling pathway. I) Interaction between CCAT2 and TCF contributes to the activation of Wnt signaling pathway. Interestingly, both the Wnt and Akt pathways are activated in Twist-overexpressing cells; because of this, Hela cells maintain EMT-associated stem cell-like traits. This brings us to the question: excluding other proteins, does the Wnt signaling pathway interact with other signaling pathways in CC? H. T. Kwan et al showed that AMPK activators suppress DVL3 protein synthesis via AMPL/mTOR signaling, impairing DVL3-mediated Wnt/ β-catenin signaling and thus inhibiting CC cell growth. This study verified that an interaction exists between the Wnt signaling pathway and the AMPK/mTOR signaling pathway. Another potential interaction is indicated by WIF1 overexpression inducing a significant increase in caspase-3/7 activity in Hela cells with WIF1 transfection. This suggests that the Wnt signaling pathway also has relationships with the apoptosis signaling pathway. Perhaps there are other associations between the Wnt signaling pathway and other signaling pathways; these are worth studying thoroughly, as the results may allow an earlier diagnosis and more effective treatment of CC. MicroRNAs (miRNAs), a class of small non-coding RNAs, play important roles in regulating gene expression in the context of tumorigenesis and tumor progression. Because of this, miRNAs rapidly became the center of scientific research once they were discovered. Prior findings show that miR-142-3p causes downregulation in CC cells. Gain and loss of function experiments revealed that miR-142-3p overexpression results in Fzd7 downregulation and inhibits proliferation and invasion in CC-derived cell lines; conversely, Fzd7 overexpression reverses the inhibitory effects induced by miR-142-3p. 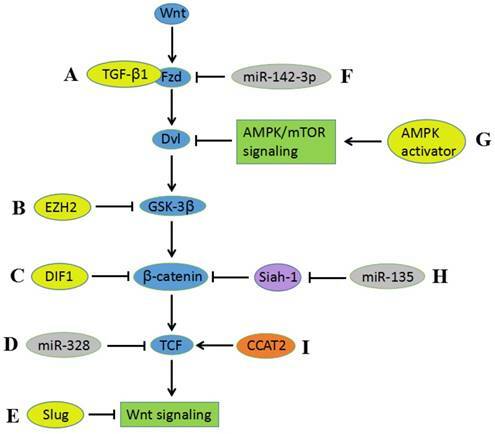 Similarly, there are studies demonstrating the growth suppressive activity of miR-328 in CC, which is largely ascribed to TCF7L2 downregulation; these studies also show that miR-135a/Siah-1/β-catenin signaling is important in CC transformation and progression, and several miRNAs may affect the level of components in Wnt signaling pathway[100-102]. Interestingly, HPV16-miR-H11, which is encoded by HPV, can be detected in CIN 1 tumor tissue and may interact with WNT4. lncRNAs, which are non-coding RNA molecules with over 200 nucleotides, have recently played vital functional roles in chromatin modification, transcription gene regulation, and post-transcriptional management [104,105]. Increasing evidence has indicated that lncRNAs are involved in tumorigenesis[106-108]. Le Wu et al reported that lncRNA CCAT2 promotes the proliferation and survival of cervical cancer cells. Previous studies have also found that CCTA2 increases Myc via TCF7L2-mediated transcriptional regulation. Moreover, physical interaction between CCAT2 and TCF7L2 contributes to the activation of the Wnt signaling pathway. There is a study reported that lncRNA NNT-AS1 could act as oncogenic lncRNA that promote cerical cancer cells growth and invasion by modulation of Wnt signaling pathway. However, researches directly investigating the specific mechanism between lncRNAs and Wnt signaling pathway in CC are still not enough, further knowledge in this area is needed. In conclusion, the Wnt signaling pathway interacts with other pathways to either advance or inhibit CC development, progression, and invasion. Non-coding RNAs also play important roles in tumorigenesis and tumor progression regulation in CC via the Wnt signaling pathway. However, the specific mechanism of these non-coding RNAs still requires more research. Modern tests used in CC screening, such as the Papanikolaou and HPV tests, are credited with the decreased incidence of invasive CC and CC-related deaths. The Papanikolaou test detects precancerous and cancerous cell lesions early; the HPV test detects the type of HPV infection. In localized, advanced cases of CC, pelvic MRIs and PET-CTs are used for diagnosis. However, the risk of failing to diagnose CC still remains. Although biopsy is the gold standard for identifying cancer, the possibility of a false negative is relatively high because cancerous lesions rarely develop in the early stages of CC. Wnt11 and GSK3β expression, in contrast, is detected not only in normal cervical tissues, but also increases in precancerous and cancerous lesions. This indicates that the expression patterns correlate with CC progression [45,52]. Utilizing biopsies in combination with biomarkers may increase diagnosis efficacy and facilitate the division of stages of CC. Furthermore, circulatory markers are less invasive and may be easier for patients to accept. There are no current studies reporting on the use of circulatory markers of Wnt signaling in CC. Early CC diagnosis could thus be the aim of future research. The conventional treatment for CC involves surgery, chemotherapy, and radiation. These therapies may be taken individually or as a combination. Unfortunately, these treatments fail for 30-35% of patients with advanced CC. The use of chemotherapeutic agents typically results in drug resistance via signaling pathway activation. Hence, a combination of chemotherapy and target therapy could be more effective. Medicines targeting Wnt signaling have been identified and have demonstrated therapeutic efficacy in various cancers[114-118]. Some have already progressed to phase Ⅱ oncology trials. Furthermore, increased Wnt signaling activity may sensitize cancer cells to chemotherapeutic agents. However, relatively little is known regarding the application of these medicines for CC treatment. Wang et al revealed that Avenanthramide 2P and Triptolide inhibit CC by inducing β-catenin degradation and avoiding nuclear β-catenin accumulation. Moreover, nuclear β-catenin expression is associated with a poor outcome for patients who receive postoperative chemotherapy or radiotherapy; this implies the potential for nuclear β-catenin to be a predictive marker of chemoresistance and radioresistance in CC[121,122]. Although the cure rate for early-stage CC is higher than 80%, 20% of patients with CC develop pelvic recurrence. Additionally, recurrent CC usually exhibits a poor response to radiotherapy and several chemotherapeutic agents. The reported 5-year survival rates for recurrent CC range from 10.1% to 22.3%[125,126]. Interestingly, the overall recurrence rate was significantly higher and the cancer-specific survival rate was lower in the group with increased nuclear β-catenin staining compared to the group with negative staining. Similarly, in comparison to weak APC staining, increased nuclear APC staining correlated to a significantly decreased cancer-specific survival and increased overall recurrence rate. Multivariate analysis demonstrated that Wnt5A and Wnt11 protein levels in CC were associated with overall and recurrence-free survival[44,46]. In regards to the aforementioned results, some Wnt signaling components can be used as biomarkers and prognosis indicators of CC, and other, more effective Wnt-associated biomarkers and indicators should be researched. Moreover, the combination of biopsy and Wnt signaling components is more effective and contributes to the diagnosis, division of stages, and prognosis of CC. Meanwhile, β-catenin can be an important target of therapy and a predictive marker of chemoresistance and radioresistance in CC. Understanding the underlying mechanism of this is therefore crucial for the diagnosis, therapy, and prognosis of CC. Although it still remains uncertain how exactly the Wnt signaling pathway is involved in CC, it has become clear that Wnt signaling contributes to CC pathology at multiple levels, including tumor initiation, progression, invasion, and therapeutic resistance. Furthermore, a large amount of experimental evidence suggests that the interaction between the Wnt pathway and other biomolecules and pathways can contribute to cancerogenesis and tumor progression. This research regarding the significant roles that the Wnt signaling pathway plays in CC sheds light on not only more accurate diagnostic methods, but also on new drug targets, novel treatment procedures, and prognostic factors that can be developed in the near future. This study was funded by the Natural Science Foundation of China (No. 81470133) and the Fundamental Research Funds for the Central South University (NO.2017zzts844).